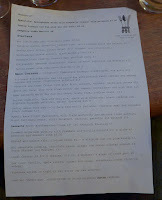 Often the most promising harbinger of a good meal is a menu, on real paper, with the date printed on top. It suggests that the kitchen is basing its dishes on the very best produce the market can offer that day, rather than buying ingredients to service a fixed, and often laminated list. Another reason to relax when entering a new dining room is the sight of an eclectic collection of cookbooks. It not only indicates that the chef is literate, it demonstrates an interest in the history and techniques of proper cooking. The Feathers Inn scores on both counts. I’ve written about its changing daily menu before. Last time, admittedly several years ago, it didn’t quite work for me. With such a large menu in a relatively small room, the execution couldn’t match the ambition. This time, however, it all came together gloriously. And they also seem to have added to their cookbook collection. Across from our table was a shelf on which sat weighty, important and illuminating tomes from Escoffier to McGee. 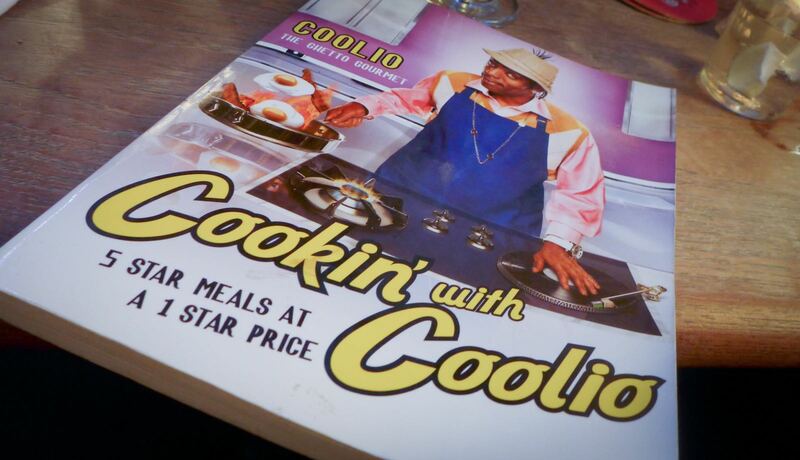 There was also, to much mirth, a copy of “Cookin’ with Coolio”, offering recipes from the Ghetto Gourmet himself. Thankfully the menu for the evening bore more influence of the former than the latter. It majored on game, autumnal vegetables, fish and sensible, classical preparations. 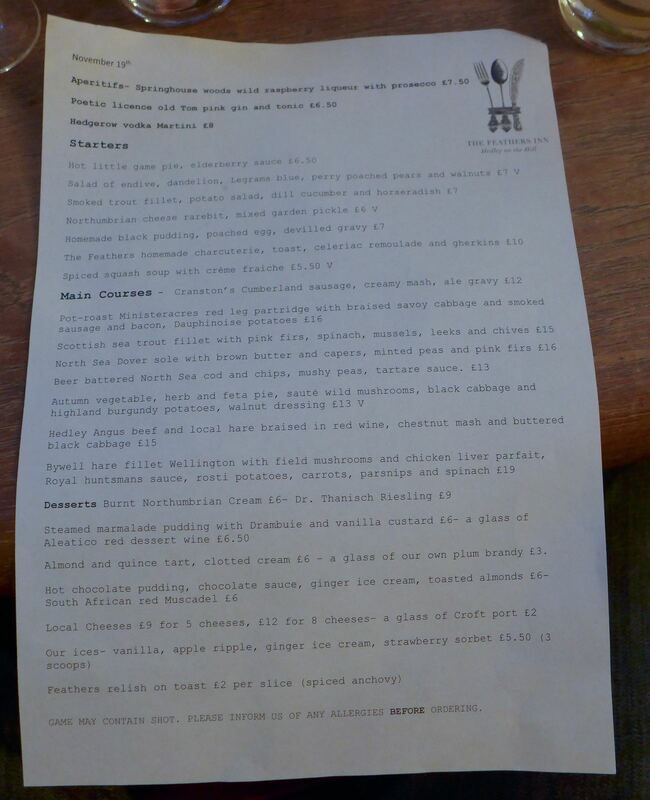 It was that rare thing: a list from which I’d happily, like the monstrously obese Mr Creosote from Monty Python’s The Meaning Of Life, order the lot. 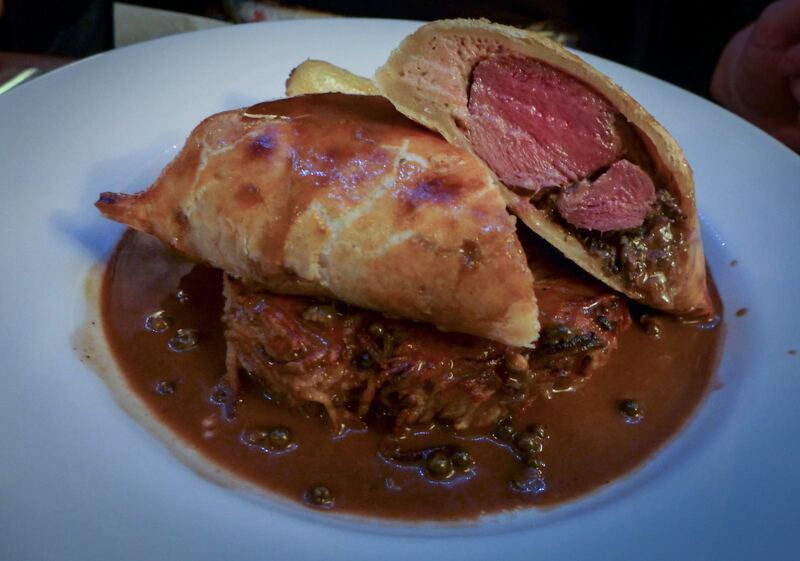 And there, right at its heart, and with my name on it, was one absolutely sensational dish: Hare Wellington. I have sliced into many a variation of Wellington in my time, but this was an exceptional treat. 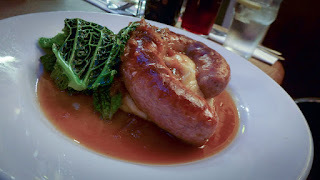 In the hands of chef Rhian Cradock it was shockingly good. The animal itself, which used to live in Bywell just the other side of the Tyne, was ripe and wild with just a touch of offaly funk, echoed by a superbly rich chicken liver parfait. 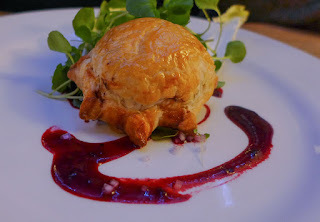 Mushroom duxelles were heady with Madeira and the pastry was first rate. The whole arrangement came swimming in a huntsman’s sauce of almost intangible depth. 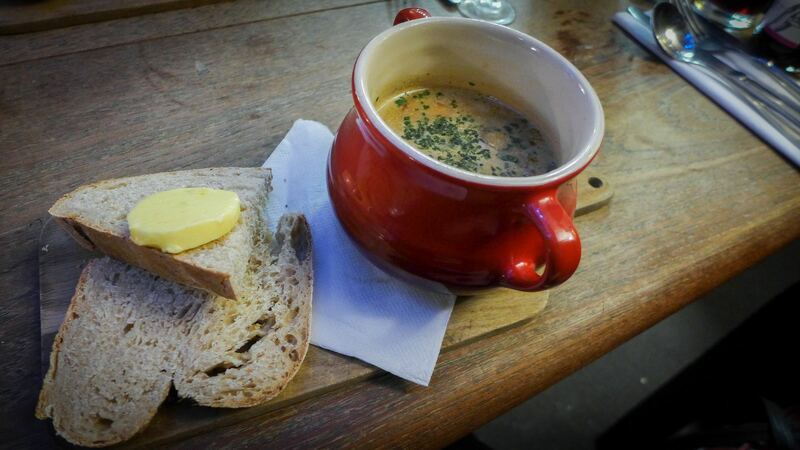 Traditionally this is prepared with the blood of the hare. It tasted like Mr Cradock had followed that tradition. This was possibly the finest dish I have tasted all year – it almost merited 5 stars on its own. But there were further outbreaks of excellence. A salad of endive, dandelion and blue cheese had, like a well-made martini, just enough chastening bitterness to keep me coming back for more. 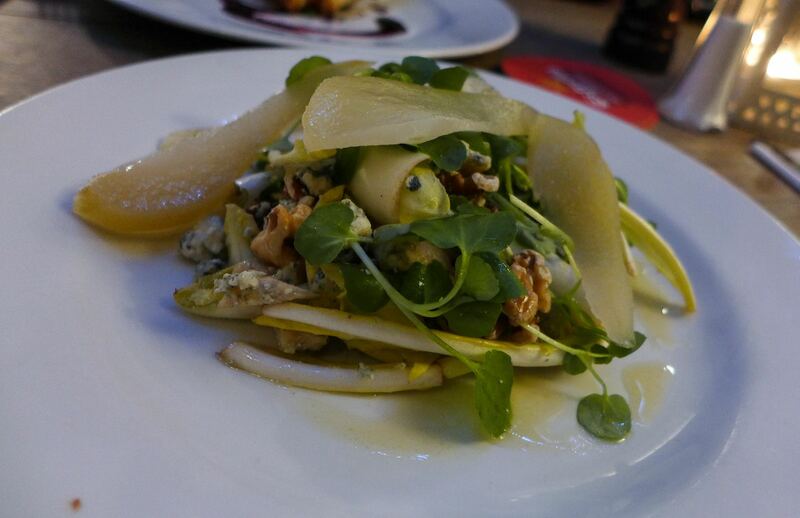 Sweetness came from pears whose flavour was jacked up by poaching in perry, while walnuts added texture. Meanwhile, Mrs Diner’s spiced squash soup was an unexpected triumph, possessing a glorious smokiness and pitch-perfect seasoning. One of our friends ordered a "hot little game pie" with elderberry sauce as a starter. 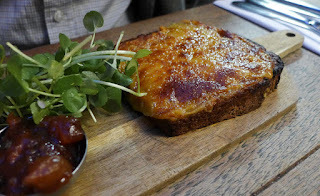 It was certainly little, so much so that I never got a look in: my raised fork was about to dive in to sample its hot little crust, when I watched my friend demolish it in two mouthfuls. He said it was very good and I believed him. The autumnal theme continued elsewhere. A braise of Angus beef and more hare was accompanied by a fine chestnut mash that, with a squally wind blowing up outside, seemed exactly the right thing to be eating at that moment in time. A plate of sausage and mash was the least gastronomical thing we tried, but it was about as good as it could have been, which was quite good enough, thank you. The two desserts we tried were similarly pleasing. 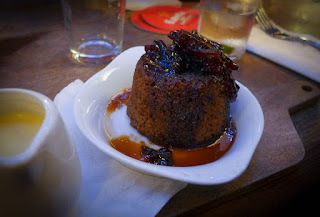 A steamed marmalade pudding, with a lovely bittersweet tang, tasted like it could have been made using a jar of the Aged Diner’s own brand (that’s a compliment: my Mum makes really good marmalade). A chocolate pudding, somewhere between a sponge and a brownie, was also well received by all the spoons that demolished it. The only moderately duff notes were sounded by the plates served to our friend, a vegetarian. 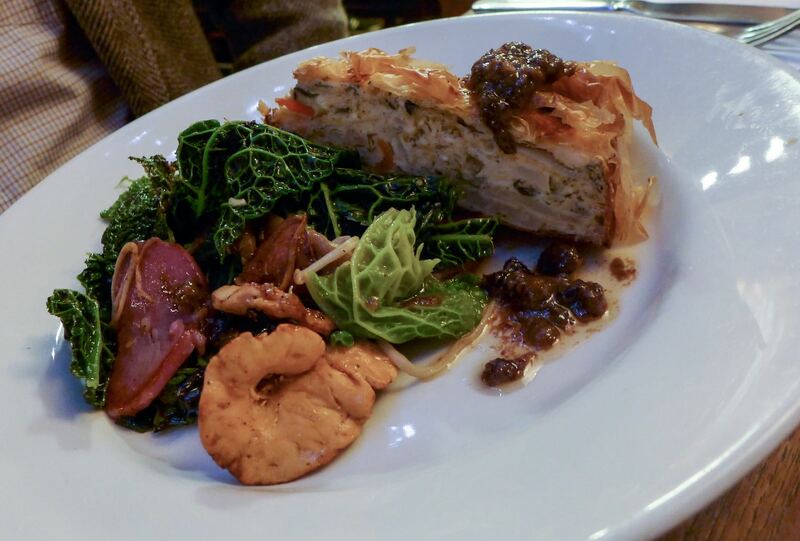 A starter of cheese rarebit was merely adequate, while his main course had some interesting accoutrements of purple potatoes and a lovely sauté of mushrooms, but the main event, a filo pie of herbs and feta, was judged by all to be too light on the cheese. Service was a little patchy, but friendly and well informed. It should be noted, for fairness, that we caught them in the midst of a frantically busy Saturday night. I think it is referred to in the industry as being a little bit “een ze sheet”. We started with some really fine sherry before moving onto a bottle of French Malbec from a short and snappy wine list that had a few more glamorous offerings for those with the means. Sometimes I visit a restaurant that I am certain is capable of excellence, but for whatever reason, it just doesn’t quite happen on the night. Unfortunately I am bound by the rules of my job: one meal, one night, one verdict. So I write my thousand words, dish out some stars and move on. That’s what happened on my previous visit to The Feathers, and since then I’ve always suspected my 3-star rating might have been, well, under-rated. So I’m glad I returned. 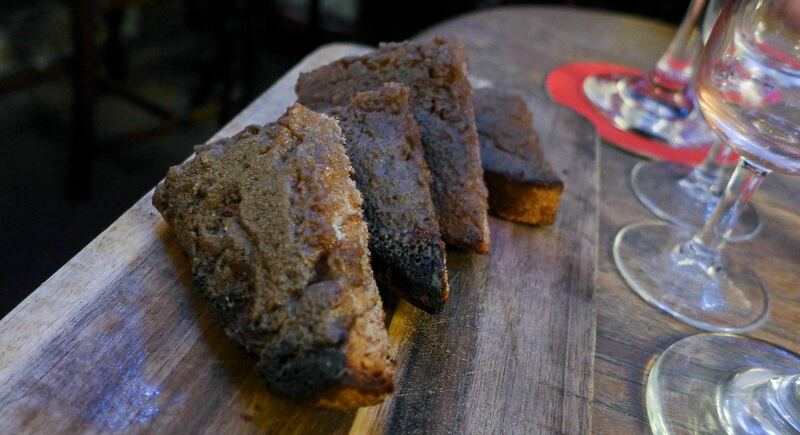 I’m pretty confident that five stars is a more accurate reflection of Cradock’s cooking. It is not necessarily refined in terms of presentation, but it packs a massive wallop of flavour and is entirely at home in this most homely of venues. 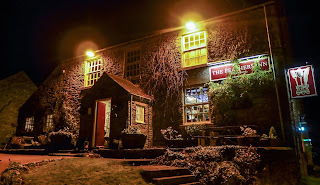 Don’t expect the menu to be the same as this when you visit – it almost certainly won’t be – but I expect you will find things on it that will richly reward the winding, windy trip up to Hedley on the Hill. Great review, love this place and never had a bad meal. 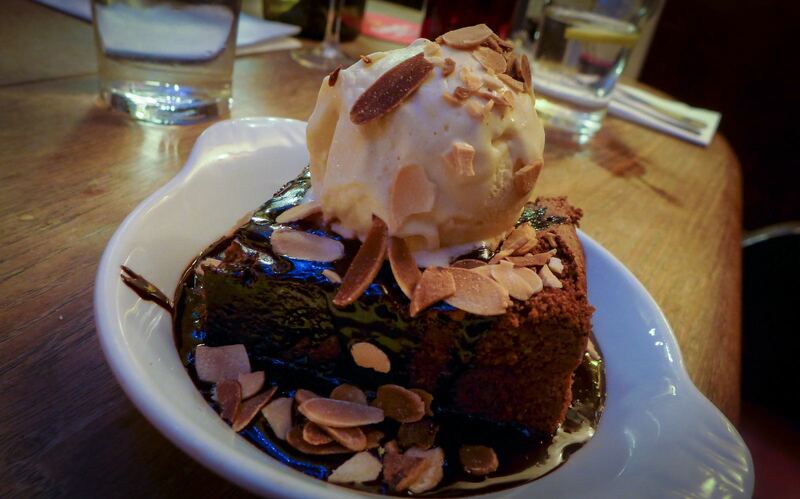 The only issue in the past has been the deserts not quite matching the rest of the meal for me.... but last time i was there it was exactly how it should be and not a single thing wrong.